Your doctor may recommend surgery for a torn rotator cuff if your pain does not improve with nonsurgical methods. Continued pain is the main indication for surgery. If you are very active and use your arms for overhead work or sports, your doctor may also suggest surgery. The type of repair performed depends on several factors, including your surgeon’s experience and familiarity with a particular procedure, the size of your tear, your anatomy, and the quality of the tendon tissue and bone. Many surgical repairs can be done on an outpatient basis and do not require you to stay overnight in the hospital. Your orthopaedic surgeon will discuss with you the best procedure to meet your individual health needs. You may have other shoulder problems in addition to a rotator cuff tear, such as osteoarthritis, bone spurs, or other soft tissue tears. During the operation, your surgeon may be able to take care of these problems, as well. The three techniques most commonly used for rotator cuff repair include traditional open repair, arthroscopic repair, and mini-open repair. In the end, patients rate all three repair methods the same for pain relief, strength improvement, and overall satisfaction. A traditional open surgical incision (several centimeters long) is often required if the tear is large or complex. The surgeon makes the incision over the shoulder and detaches the shoulder muscle (deltoid) to better see and gain access to the torn tendon. Open repair was the first technique used for torn rotator cuffs. Over the years, new technology and improved surgeon experience has led to less invasive procedures. Even though your tear has been repaired, the muscles around your arm remain weak. Once your surgeon decides it is safe for you to move your arm and shoulder, a therapist will help you with passive exercises to improve range of motion in your shoulder. With passive exercise, your therapist supports your arm and moves it in different positions. In most cases, passive exercise is begun within the first 4 to 6 weeks after surgery. After 4 to 6 weeks, you will progress to doing active exercises without the help of your therapist. Moving your muscles on your own will gradually increase your strength and improve your arm control. At 8 to 12 weeks, your therapist will start you on a strengthening exercise program. Expect a complete recovery to take several months. Most patients have a functional range of motion and adequate strength by 4 to 6 months after surgery. Although it is a slow process, your commitment to rehabilitation is key to a successful outcome. The majority of patients report improved shoulder strength and less pain after surgery for a torn rotator cuff. Each surgical repair technique (open, mini-open, and arthroscopic) has similar results in terms of pain relief, improvement in strength and function, and patient satisfaction. Surgeon expertise is more important in achieving satisfactory results than the choice of technique. > Nerve injury. This typically involves the nerve that activates your shoulder muscle (deltoid). > Infection. Patients are given antibiotics during the procedure to lessen the risk for infection. If an infection develops, an additional surgery or prolonged antibiotic treatment may be needed. > Deltoid detachment. During an open repair, this shoulder muscle is detached to provide better access to the rotator cuff. It is stitched back into place at the end of the procedure. It is very important to protect this area after surgery and during rehabilitation to allow it to heal. > Stiffness. Early rehabilitation lessens the likelihood of permanent stiffness or loss of motion. Most of the time, stiffness will improve with more aggressive therapy and exercise. >Tendon re-tear. There is a chance for re-tear following all types of repairs. The larger the tear, the higher the risk of re-tear. 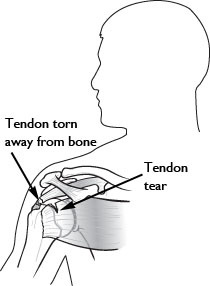 Patients who re-tear their tendons usually do not have greater pain or decreased shoulder function. Repeat surgery is needed only if there is severe pain or loss of function. Many orthopaedic surgeons have begun to use dissolvable anchors. Anchors hold stitches in place in the bone until the repair has healed. Dissolvable anchors are gradually absorbed by the body. 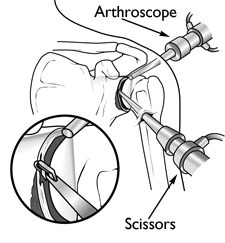 Future developments in the treatment of rotator cuff disease include newer arthroscopic surgical techniques. These allow more secure repairs that may improve the rate of tendon healing. One of the most exciting areas of research is orthobiologics. These are tissue grafts and injections that promote growth of new tissue in the body and foster healing.